A distinct form of protest has been developed to expose and hold to account those responsible for torture and disappearances during Pinochet's dictatorship. The return of the right wing to power in Chile has come at the expense of those still seeking justice for crimes committed during the 17-year U.S.-backed dictatorship of Augusto Pinochet, which ended in 1990. Former President Michelle Bachelet’s failure to close the luxury five-star prison of Punta Peuco that houses ex-torturers and military agents convicted of crimes against humanity has led to repercussions during the first year of Sebastian Pinera’s presidency. Over the years, the Chilean military has lobbied for “understanding” the context in which torture and disappearances occurred, in order to procure release for convicted agents of the dictatorship. In August, seven were granted conditional release, prompting an outcry among Chileans. Raul Meza, a lawyer who represents torturers imprisoned in Punta Peuco, has stated that he will appeal for the conditional release of a notorious torturer, Miguel Krassnoff Martchenko, who is serving over 500 years for crimes against humanity. With no support from the government, relatives are running out of time to obtain information about the disappeared. The transition to democracy in Chile has remained tethered to Pinochet’s constitution, which has sparked ongoing protests to preserve social or collective memory. 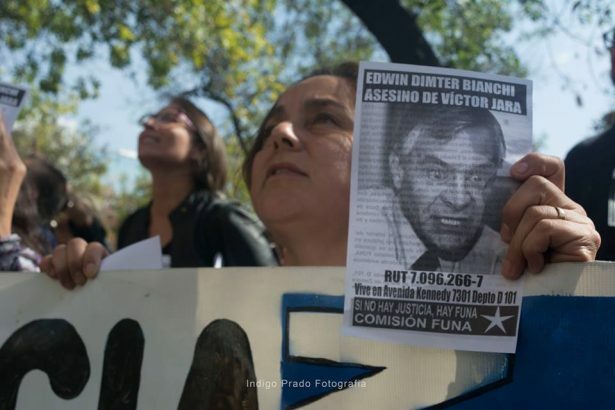 Since 1999, an organization called Comisión Funa has been committed to seeking justice for those whose human rights were violated during Pinochet’s dictatorship. It has developed a distinct form of protest that directly challenges impunity backed by both the government and the military. Their approach involves exposing dictatorship criminals at their residencies or place of work and incriminating them within Chilean society. Saravia’s parents were communist militants and members of the central committee of the Juventudes Comunistas de Chile, the youth wing of the Communist Party, which was at the forefront of resistance to the Pinochet dictatorship. His father was a political prisoner, tortured to death by the dictatorship when Saravia was nine years old. Comisión Funa was born in early October 1999, after Pinochet had been arrested in London upon a request from Spanish Judge Baltasar Garzon. 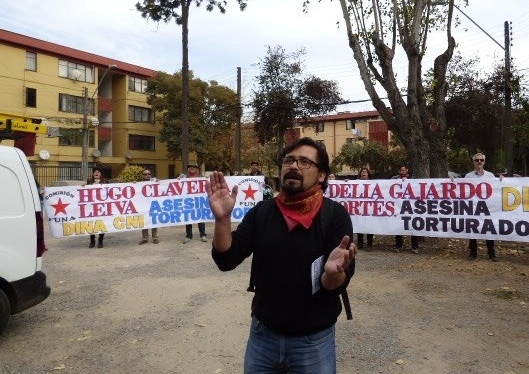 Comisión Funa’s first protest exposed former torturer Alejandro Forero Alvarez, who is working to this day at a private clinic as a cardiologist. His role as an agent of the dictatorship was to supervise torture sessions to ensure that the tortured political prisoner would not die before divulging information. After being exposed, many torturers have been forced to relocate due to the public pressure. 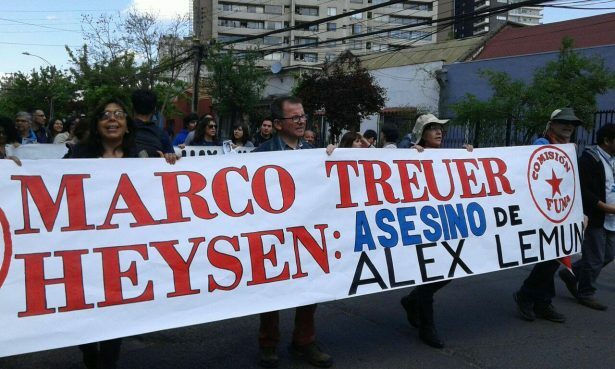 Marco Treuer, the police officer who murdered Mapuche teen Alex Lemun, was another target of activists. “I cannot tell for sure that the case was reopened after our protest, but a few days after our mobilization, the judiciary decided to bring the accused, who is a public employee, to face trial,” Saravia said. Ruth Loreto Lazo Pastore is a regular participant in Comisión Funa’s protests. Her father, Ofelio de la Cruz Lazo Lazo, was one of the disappeared victims of Operacion Colombo on July 30, 1974. Comisión Funa’s protests are also an expression of indignation toward Chile’s justice system, which — according to Saravia — has handed out ridiculous and shamefully short sentences to agents convicted of crimes against humanity, not to mention the special luxury jails in which they are imprisoned. Chile’s judicial system determines the punishment for dictatorship-era crimes, which allows indicted military agents to benefit from a reduction in their sentence for offering to collaborate during court investigations. Its response to crimes against humanity “is totally inconceivable in many countries throughout the world, especially in Europe,” Saravia said. Fernando Burgos Diaz, a former member of the National Information Center, who participated in the killing of Julio Guerra and the kidnapping of Esther Cabrera Hinojosa, is running a lucrative family business for “esoteric and spiritual therapy.” He only served a sentence of three years and one day for both crimes and is now free.